I love the Fall season -- the air is crisp and the days get shorter, making it the perfect time to bring out Fall recipes that include pumpkin, apples and winter squash. These Fall foods are rich in many nutrients and add new seasonal variety as the summer fruits and vegetables disappear. When I was a kid, there were 3 varieties of apples available to me: Red Delicious, Golden Delicious and Granny Smiths. Today, there are so many varieties to choose from and in my opinion, they taste so much better! So I encourage you to be adventurous and choose a new variety at the store or farmer’s market that you haven’t tried before! On the nutrition side, apples are a good source of Vitamins B and C, fiber and phytonutrients. The combination of vitamin C and phytonutrients help protect the body from free radicals associated with aging and also increase immunity to help fight off infections as we move into the winter months. Be sure to eat the skin on the apple because the phytonutrients are 3-4 times more concentrated in the peel. On the food & eating side, eat an apple with string cheese or almond butter to boost your energy and prevent those afternoon sweets cravings. Don’t forget to add apples to yogurt or oatmeal at breakfast or add chopped apples to your salad at lunch or dinner. Bonus: Try my Apple Crisp recipe this Fall or during the holidays for a healthier alternative to Apple Pie. Pumpkin has many great health benefits, including being one of the best sources of beta-carotene -- an antioxidant that gives pumpkin its vibrant orange color, while helping to delay aging and reducing the risk of asthma, heart disease and certain types of cancer. Eating pumpkin is good for the heart and a great post-workout recovery food. Why? Because it’s high in potassium. Potassium is important for keeping blood pressure in check, helps restore much needed electrolytes after a heavy workout, helps prevent muscle cramping and muscle mass. Pumpkin is also a good source of fiber. Most Americans don’t get nearly enough fiber each day, so adding pumpkin to recipes you’re already making can boost the fiber content. For example, add chunks of pumpkin to soup or add a couple tablespoons of canned pumpkin to your morning oatmeal. You can also try this pasta recipe with pumpkin if you’re really adventurous! Preparing pumpkin from scratch will provide the highest level of nutrients, but if you’re like me, I just don’t have the time to cook it and prepare it. The good news is, canned pumpkin delivers great nutrition too! Just be sure that the ingredient list is pumpkin or pumpkin and water, nothing else. Be careful because canned pumpkin pie filling looks pretty similar in the can, but doesn’t deliver the same nutrition and has lots of sugar. Make your pumpkin pie with canned pumpkin and add your own spices and sugar so you can control how much is added. It’s recommended that we eat at least ½ cup of yellow/orange vegetables daily. Pumpkin can certainly help us reach that goal, but so can winter squash! The different varieties typically have a vivid orange or yellow flesh because of the concentration of caretonoids (antioxidants) that get converted into the active forms of vitamin A (retinoids). Only sweet potato, carrots and green leafy vegetables have more carotenoid content than winter squash. 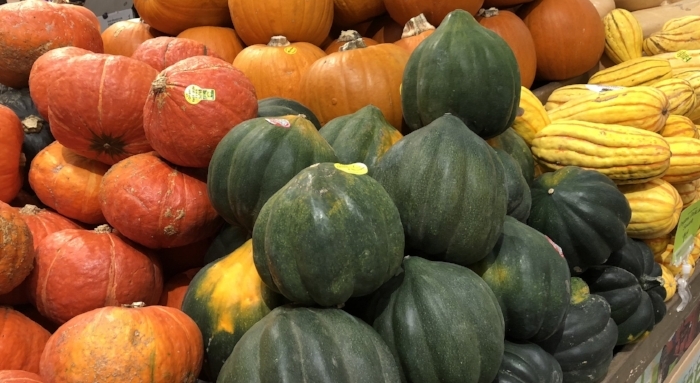 Winter squash refers to a family of vegetables, including acorn, butternut, kabocha, buttercup, spaghetti, blue hubbard and delicata, to name a few. Each has a distinct texture and flavor, so I challenge you to try a different squash each week for 7 weeks, and you’ll have prepared each one of these. Let me know which varieties you like best and be sure to share your recipes! I’ll then share them with my friends and followers. To help you get started, try this simple spaghetti squash recipe. Cheers to Healthy Fall Foods!